What is Dapa (Indapamide Hemihydrate) used for? 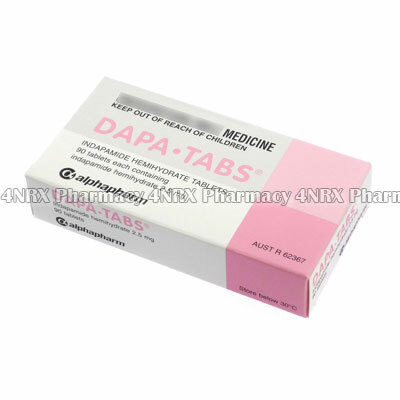 Dapa (Indapamide Hemihydrate) is a diuretic medication prescribed to treat patients suffering from high blood pressure (hypertension) or oedema (fluid retention). It operates by preventing sodium absorption in the body to draw excess out of the system to be eliminated through urination. Your doctor may also prescribe this medication to treat other unlisted conditions. How should I use Dapa (Indapamide Hemihydrate)? Follow your doctor`s instructions for using Dapa (Indapamide Hemihydrate) to get the safest and most effective results. It is normally taken orally once each day, usually in the morning to avoid sleep disturbances caused by urination, but your particular regimen will be determined by the severity of your symptoms and health condition. Always swallow the tablets whole without crushing, chewing, or splitting them as this may destroy or alter the effects of their contents. You are also suggested to increase your fluid intake to prevent dehydration as this medication causes increased urination. If you have any questions about using the medicine, ask your doctor or pharmacist to ensure the correct application. What are the side effects of Dapa (Indapamide Hemihydrate)? Tell your doctor if any of these symptoms become intense or if you experience any serious side effects such as a dry mouth, nausea, vomiting, muscle pain, increased heart rate, or faintness. These conditions may require medical attention or adjustments to your regimen to prevent further complications from occurring. Do not begin using Dapa (Indapamide Hemihydrate) if you suffer from gout, glandular disorders, or a kidney condition that prevents the production of urine. Also inform your doctor if you have diabetes, an inflammatory disease affecting connective tissues, or Addison`s disease. These conditions may require reduced dosages or other adjustments to prevent potential problems from occurring. Strictly use Dapa (Indapamide Hemihydrate) as prescribed and follow all instructions provided by your doctor. Safe, suitable, and optimum dosage can vary and is dependent on the patient`s health and medical history, as well as the condition you are treating. Dapa (Indapamide Hemihydrate) may not be safe or suitable for all patients. Always ensure your doctor is informed if you are pregnant or breastfeeding, using any other type of medication (including non-prescription medicine, vitamins, and supplements), as well as if you have any allergies, other illnesses, or pre-existing medication conditions.